Our favorite photos from 2017. A few details about our kiln opening event. 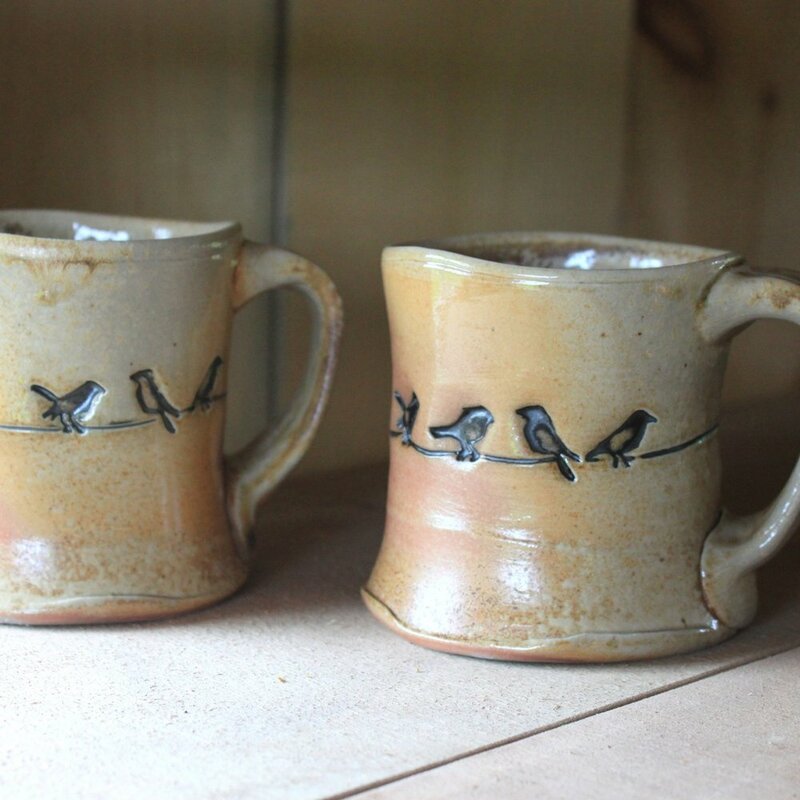 We hope to have new bird mugs + spoon rests + mason jars in another couple of weeks, and we'll update again at that time. Again, here's the link to the shop which will be updated Monday at 11am. You can "favorite" us for up-to-the-minute updates on new work posted there. We're really looking forward to bringing our brand-new wood-fired work to "the Fair", our biggest show of the year. Join us at Mt. Sunapee Resort in Newbury, NH, August 1st - 9th, for the 82nd Annual League of NH Craftsmen's Fair. It's a fantastic - and big! - show, so look for Two Potters in the front of Tent #6. The show runs 10 am to 5pm daily, plus we're open until 8pm on Thursday, August 6th. Here's a little preview . . .
We'll be posting new pieces to our Etsy shop in mid-August. Stay tuned! 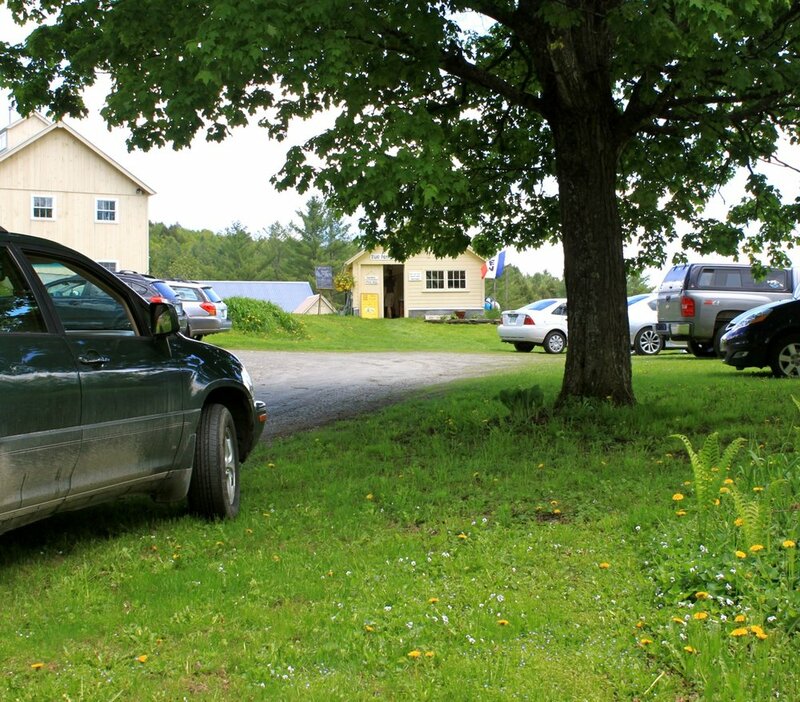 I'm packing up to go to the lakes region of New Hampshire this weekend for a small evening show that I've heard many great things about - it's the Squam Art Fair at Rockywold Deephaven Camp on Squam Lake in Holderness. It's this Saturday night, June 6th, from 7:30pm to 10pm. Here's a link to the other fine vendors you'll find. We're looking forward to being a part of this! We were so happy with our last wood-firing. I'm not sure we've yet shared the results, in photo form, in this space. Here are some of our favorites . . . It was honestly a bit of a scramble to decide in late August that we should try to turn over a firing in a mere eight weeks. I am happy (and, yes, a bit tired) to report that we totally. did. it. This was by far the smallest window of time we'd given ourselves to fill all 350+ cubic feet of our large kiln. We plugged away through the month of September, and Nathan threw lots of big bowls and crocks, which helped a lot. We were also super lucky to have the contributions - in pottery as well as time!! - of several other local potters, who agree to trade labor for kiln space, an arrangement everyone seems to enjoy. 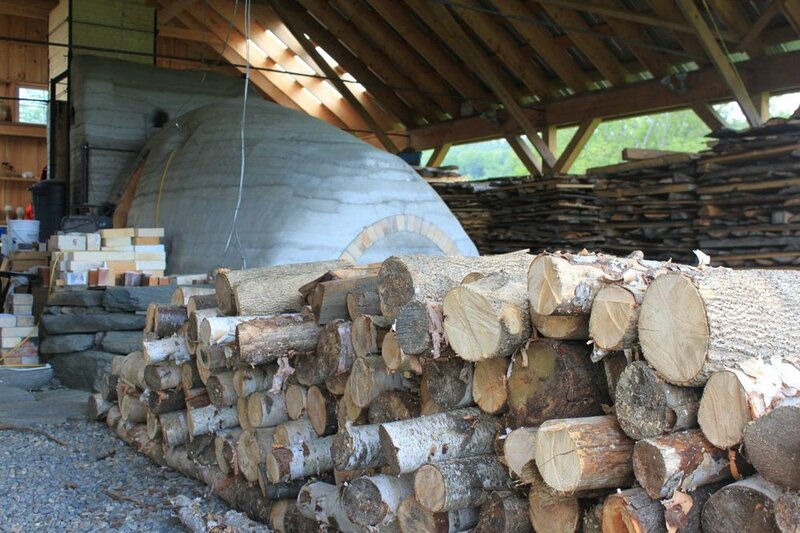 The wood had been prepped well in advance, and was sheltered under our very large kiln shed, a thing of beauty for which we will no doubt be eternally grateful. We gave ourselves a much bigger window to load the kiln - nearly two weeks - which was a nice change of pace from what has historically been a last-minute all-hours push. As they say, kids change everything, and we decided it would be a lot more sane to work the loading into our normal daily routine. And yet somehow (why, why, why???) we were still bricking up the doors late into the night before we were scheduled to begin . . . sigh. This firing was characterized by a nearly constant rain, but thankfully, we stayed warm and dry throughout. The fourth and final day of the firing was smooth, and we pulled many very lovely clay rings from the kiln, promising the hope of many beautiful pots within. We were not disappointed. I'm sure at some point, we'll have to stop saying "this was our best firing yet," but IT WAS. It's tough to let the kiln cool for a full week for a peek at what lies within, but it was- and always is- worth the wait. We had a wonderful weekend for the Vermont Open Studio Tour. 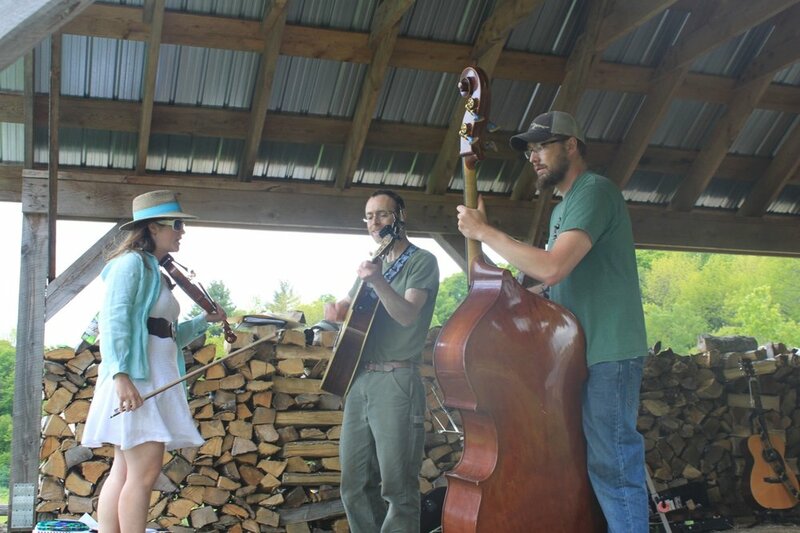 Thank you to all who turned out to see our latest firing and enjoy some great live music (thank you Matt, Adam, and Carrie!) under the tractor shed. It felt great to have family and friends and babies soaking up the bright sun and brilliant green colors of spring. Out at the kiln, there was much to celebrate. Our firing wrapped up last week, and had been cooling until the day before the event. Happily, it *appears* to be our BEST firing to date. (And I say 'appears' because we haven't finished unloading its vast chambers!) 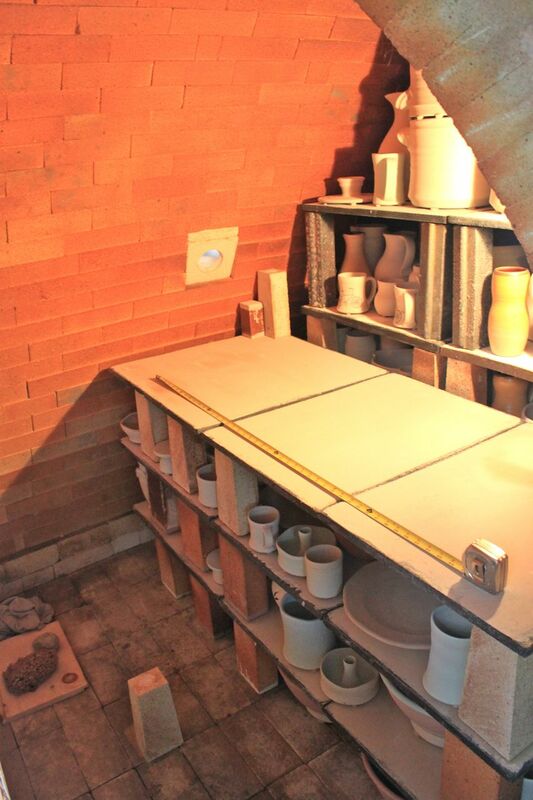 It was really fun to be able to show folks the inside of the kiln with freshly fired pottery still inside. Recently, I've fallen in love with early mornings again. In the past four months, as we've been adjusting to parenthood, we've been trying to find ways to continue making pottery - and get sleep, and have quality family time. And so we've both taken on "parents" hours, as we like to call them, with me up before dawn and Nathan in the studio after baby's (and mama's, ahem) bedtime. Nothing too extreme - sunrise isn't all that early in the winter - and baby's bedtime isn't all that late!) but enough to give us some quiet time by ourselves to collect our thoughts and prepare for, or close out, the day. Also new for me is having regular studio time most days. And I must say that there is nothing like regular studio time to enhance a feeling of flow and creativity. 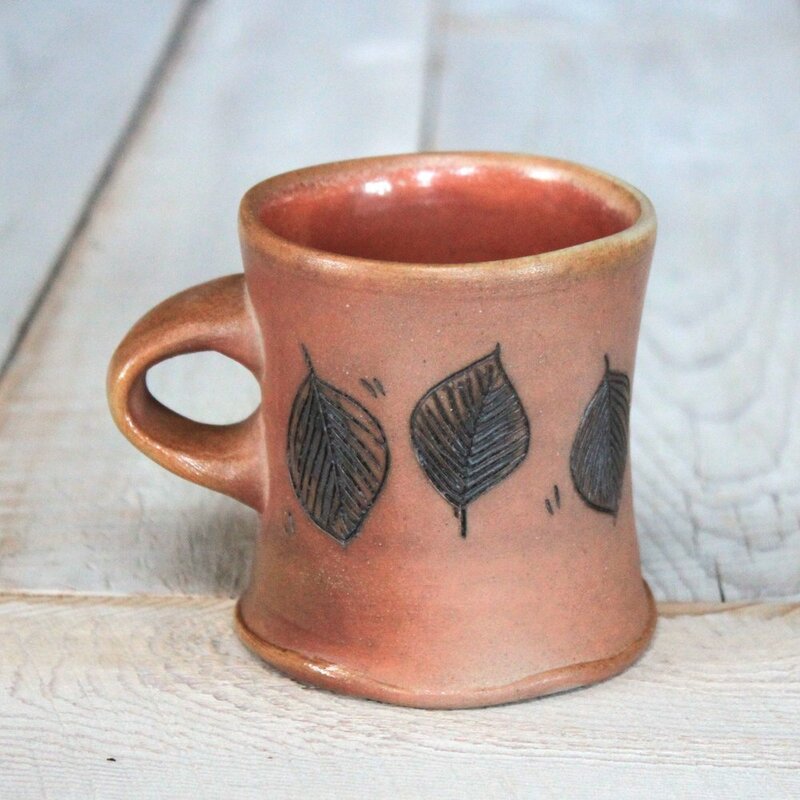 I've also chosen to focus on making one thing - mugs - for several weeks. It's been surprisingly pleasant to continue with one train of thought, so to speak, and watch my rhythms with throwing and handles get smoother and more streamlined. Sticking with one type of piece for a while has also allowed me to develop new ideas more fully. Before this, I made maybe ten or twenty of one thing, and moved on to the next shape. Maybe I've become more patient, or perhaps this style of working makes somewhat choppy hours that I have between meals and baby feedings feel more contiguous. And there's the fact that I personally have found myself enjoying my morning mug of tea all that much more. A mug can be a really personal, intimate thing. A quiet moment with a favorite mug can really set the tone for the day. It's been anything but boring. In some ways, I feel as though I could keep making mugs for a while longer, although my hands have more recently begun twitching for a different form. Soon. Oh, and there have been bikes, too. New designs, or shall I say, 'new-old' ones. I must say, it's been quite peaceful in these early mornings. Join us at our place this December 7th & 8th (that's 2013), from Noon to 4 both days. 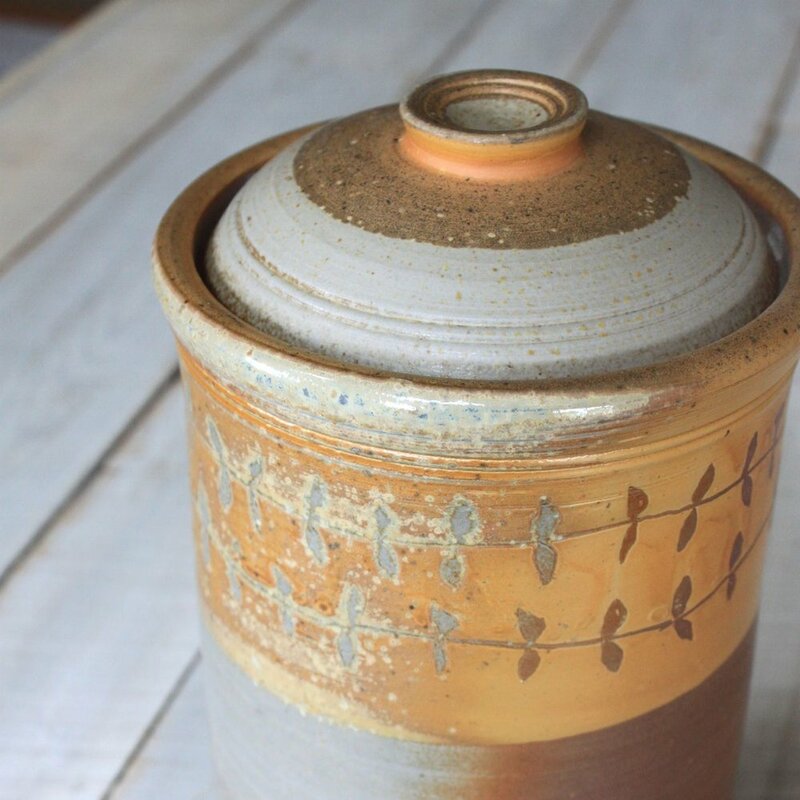 We'll have pottery firsts in the milkshed showroom and seconds/sale pots in new studio. Looking forward to it . . .
new pieces in our shop! Everything is moving a little slower around here these days (OK, maybe it's just ME that's moving slower! 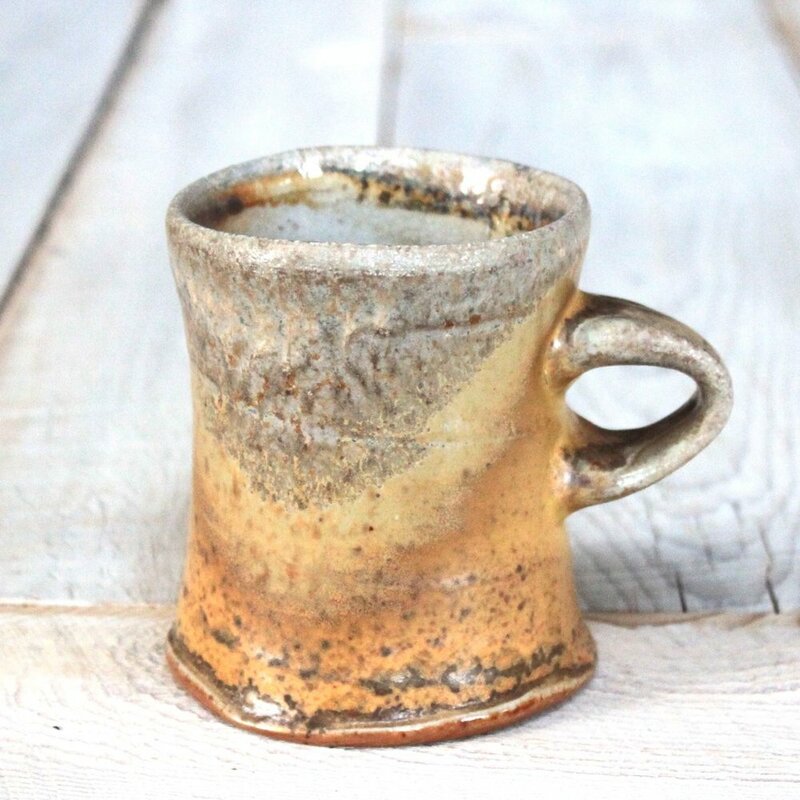 ), but I've finally gotten a nice selection of new wood-fired pottery photographed and posted for sale in our online shop. Here are some photo highlights of what's available (each photo is a direct link to the piece in our shop) . . . This was a new vase shape this year, styled after the vintage french flower buckets I love so much. 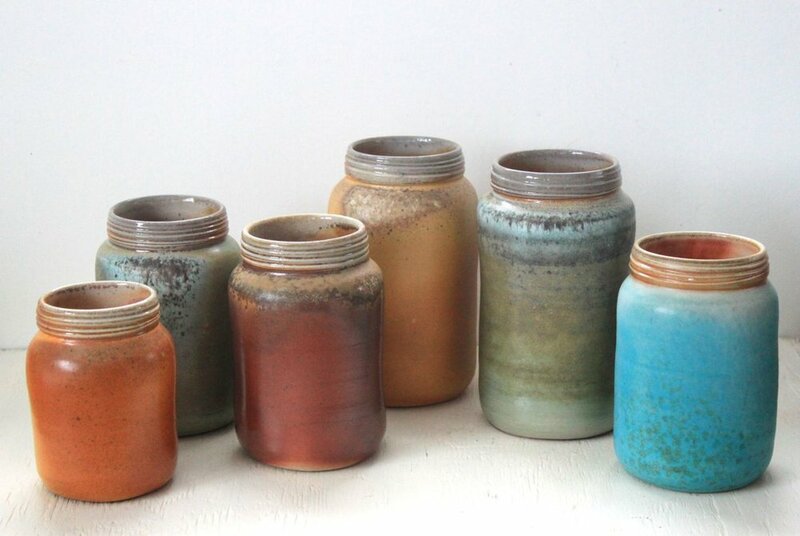 Our new mason jar shapes were a big hit at shows - we made a bunch of sizes and styles, looking like small jelly jars (as in the ones with green glaze) or pint or quart canning jars. While they don't take a screw lid (now that would be a feat of engineering reserved for slip-casting! ), they are fun to drink wine or lemonade out of, use as vases, or to hold pencils or some such thing. The shape is so classic and pleasing, I think. 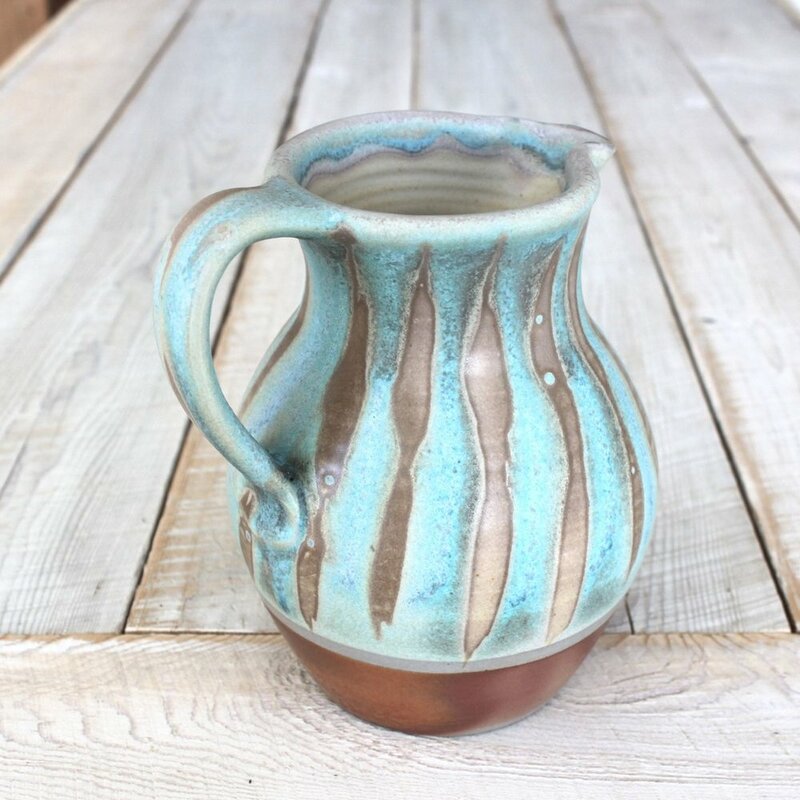 Nathan made this gorgeous pitcher . 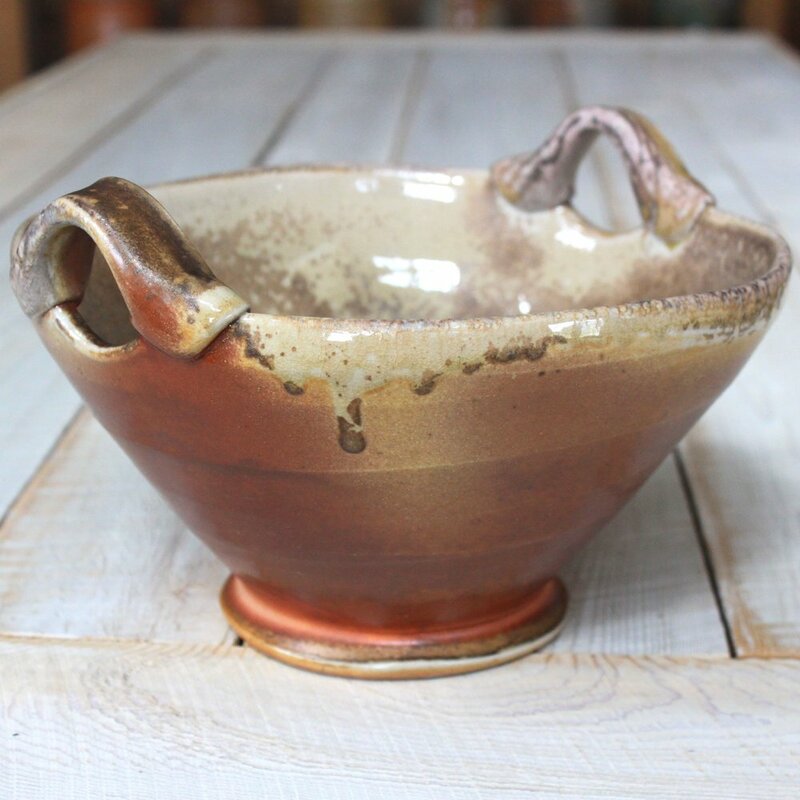 . . it's one of the best examples of a natural ash glaze, topped only by the piece below . . . designed as a tall handle-less cup for tea, with a nice saucer to boot. This piece is also glazed completely with wood ash in a multi-day firing. The range of colors and textures takes the cake! My pebble or stones designs have evolved over the years. I love pooling glaze - in this case blue celadon - around the stones, each individually formed of the same clay as the plate itself - and inset in the center and the rim. This plate is otherwise glazed and colored only with ash and flame. These are what I call my 'flower bowl' design. The narrow vase in the middle of the bowl holds a few flowers nicely, and the little cut-out at the base provides water to the stems. They make a great centerpiece or window sill display. Beyond being great for herbs or flowers in the spring, summer, and fall, we use ours at the holidays for balsam greens and holly berries. Mugs, mugs galore! There are bunch of new coffee and tea mugs in our shop, as well as some bigger ones that we tend to call 'brew fest' mugs. The orange one below and this one were thrown by Nathan and I did the handles, the slip and the glaze. :) We like mixing it up like that sometimes. I had fun working on a different shape, and even better, we both really liked the final result. 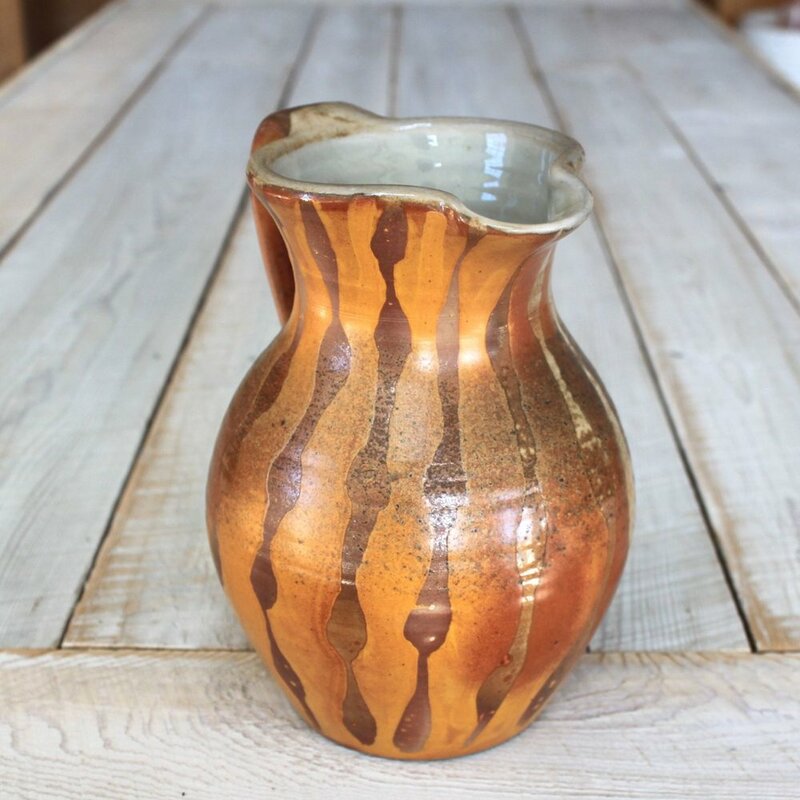 There's also a couple of nice utensil crocks just listed - including this one (above) in a bold orange color, and another one that's sort of peachy with just ash on the outside. There's quite a bit more to see in the shop, so have a look if you have a minute. As things sell, we always try to replace them, but please feel free to email us to ask about anything in particular. We almost always have other pieces in the showroom here at the studio, and are happy to send photos. 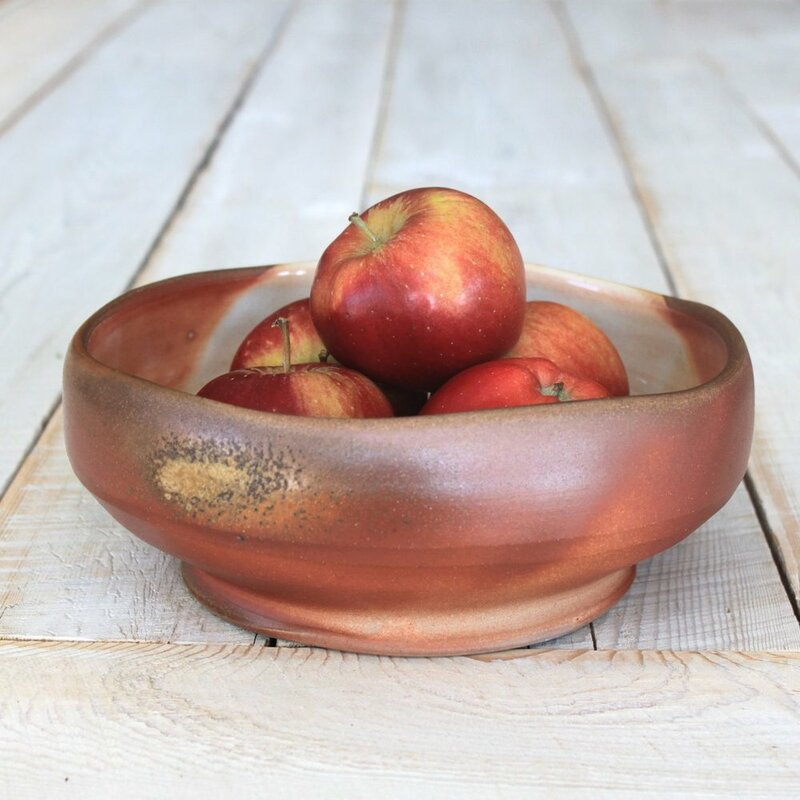 If pieces sell out entirely (which often happens with things like flower bowls and butter keepers and sometimes mugs), we can put your name on our 'wish list' and we'll hold one from the next firing for you! Thanks so much for supporting folks like us making handmade craft! Every once in a while, I'm reminded to actually enjoy the pieces we've made for a few moments before they disappear into the hands and homes of others. (It happens so quickly, the unloading of the kiln to the goodbyes!) 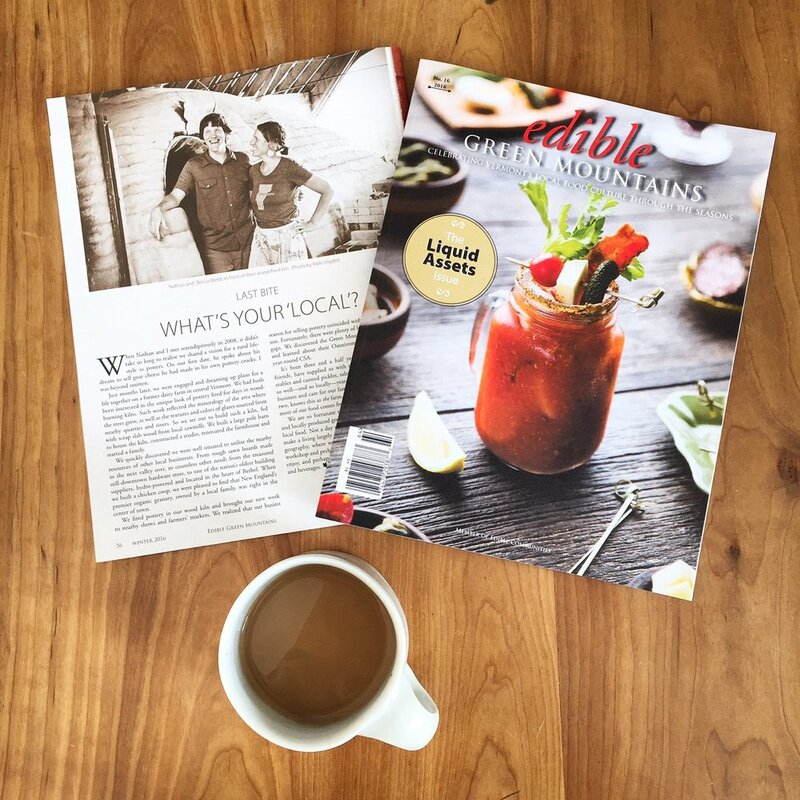 One of my favorite ways to spend some time with what we've made is to 'make it nice' in the kitchen of our farmhouse, and have a little photo shoot. Here are some shots of pieces that were included in our summer firing, as they were meant to be seen and used . . .
We have some of this new work available in our shop, and we'll be adding more pieces in the coming weeks! Just a quick note here to say that our third firing was a success! Of course, there are always hard lessons learned in wood-firing (more on that later) but overall, we were very pleased with the pottery. Here are a few snapshots from the unloading. 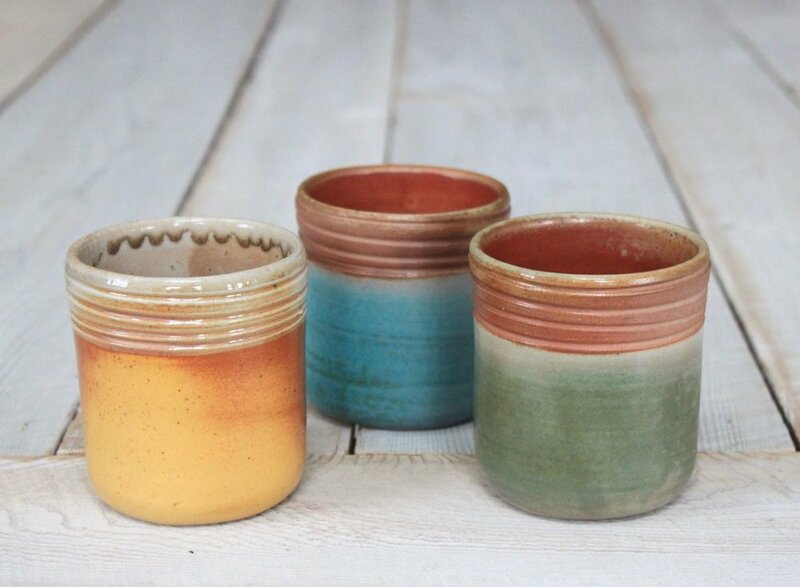 Find us + our new pots in Yarmouth, Maine this weekend for Clam Festival Craft Show! And we'll have new work on our website a little later in the summer . . . stay tuned. coming up for air : third firing done! The last few weeks here have been very full indeed. 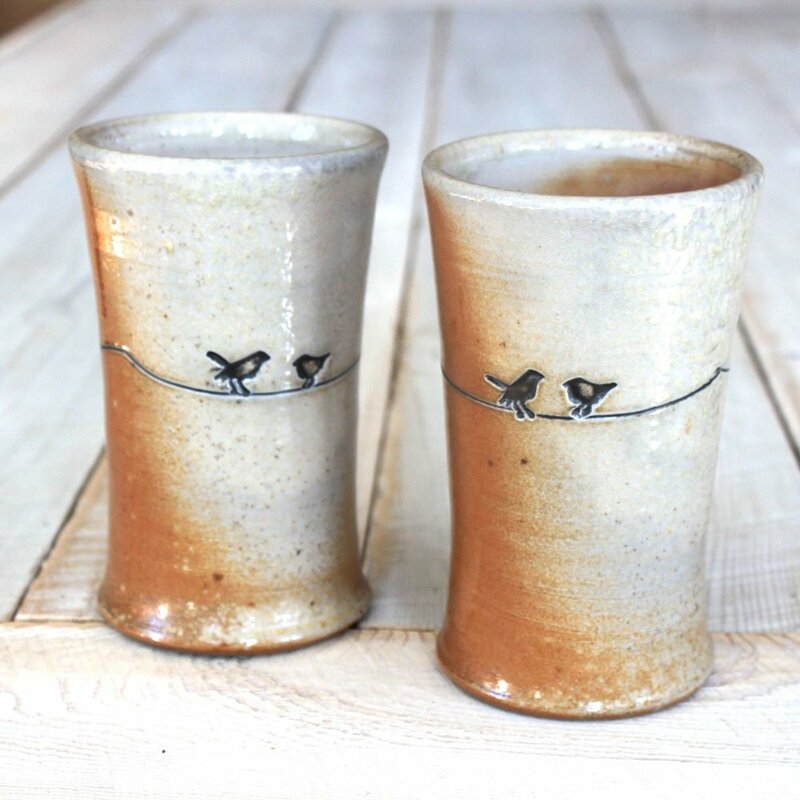 While the kiln is slowly cooling, we finally have some time to tell you about it! Since moving in to our new studio in early May, we've had about eight weeks to fill the two large chambers (about 350 cubic feet) that make up our wood-fired kiln. 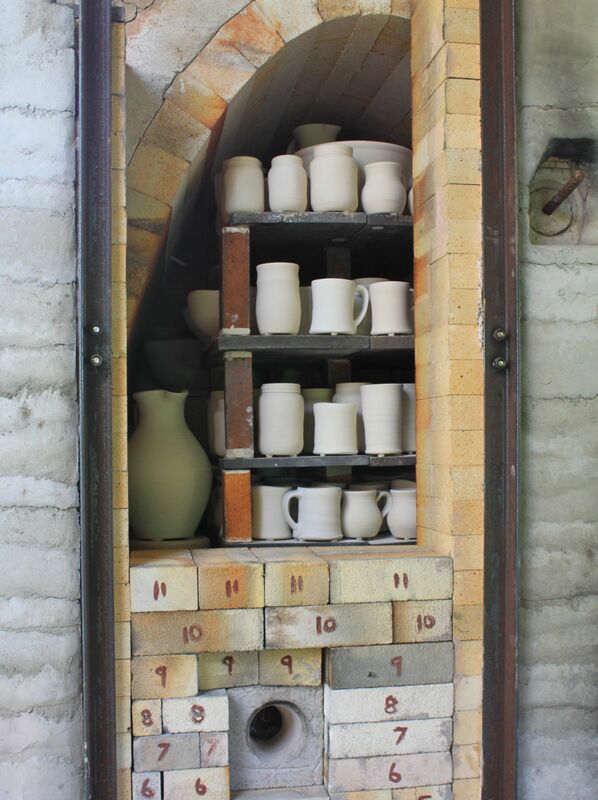 Thankfully, the work in our new space flowed beautifully, and the storage racks we built there and in the kiln shed enabled us to throw as fast as we could keep up with the drying pots. Scenes from Becca's studio . . . peony-scented pottery making. :) Lots of mugs and cups were in the works here . . .
And bowl/baskets and plates galore! Over on Nathan's side of the studio . . . The glazes get stirred and the raw pottery lined or dipped into glaze. 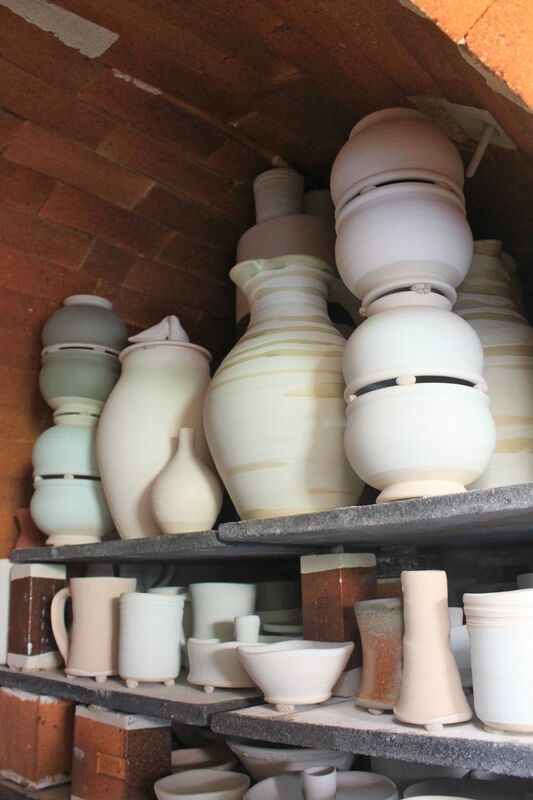 Almost all of our pottery gets glazed without being fired first - we skip the bisque firing - so it's raw or 'green.' Although this took some getting used to, this simplifies the process for us in many ways, and the piece is completed in one breath, so to speak. We do, however, have to fire the kiln much more slowly as a result, ensuring that we don't 'shock' and crack the pots. We closed in the west wall of the kiln shed last fall to accommodate nearly 100 boards of pottery and keep it dry and easily accessible for loading the kiln. This was our first time using this system, and it worked out really well. In fact, as it turns out, a full kiln load is MORE than a full wall's worth - 100 ware boards of pottery were set and ready to go. After about two months of studio work, we had around 900 pieces. Included in this firing were also pieces from potter friends and neighbors - put some pots in, take a stoking shift! From the kiln shed, we can see the new studio. We still can't quite believe that we built this between firings . . . it sure is nice to look out at our accomplishment. The view in the other direction is also great . . . pottery headed into the first chamber! We begin by stacking the front, closest to the firebox where the wood burns. This area will get the most natural fly ash and bear the brunt of the heat. It's almost seven feet tall here, so a lot of pottery goes into this area. A little farther back, in the middle of the big chamber, we loaded a lot of glazed pieces (there's not as much natural ash to do the glazing here), including Nathan's bowls which are designed to be stacked rim to rim to maximize height. The little wads of clay between them - and on the bottom of every piece in the kiln, are to prevent the pieces from fusing together or to the shelf they sit on. The loading took us about four days of very long hours. We often worked well into the evening with lights to keep us going . . .
Nathan got the very last pieces in with some crazy yoga moves . . . it's a really full load! Once we had finished loading all the pottery in, we bricked up the doors- with their handy numbers as place markers - and made fire! Minutes after starting the firing, we were treated to this in the field near the kiln, which we took as a good omen . . . The firing proceeded smoothly, and we stoked wood into the front of the kiln 'round the clock for the next four days. We were grateful to have lots of friends take shifts this time - Nathan still did about twelve hours a day, while Becca did six on the kiln plus a 'second shift' in the kitchen feeding hungry stokers! By the fourth day, we were ready to begin side stoking - where the wood goes in between the pots in the back of the first chamber and the soda/second chamber. This brings up the temperature more evenly overall and provides a little more ash on the pottery farther from the main firebox. As we near the end (gauged for us by the melt of cones and the pyrometer reading), we begin to pull small rings of clay from the view ports. Once cooled in water, they give us an idea of whether the surface of the clay is smooth and glassy. If the rings are rough, we need to keep raising the temperature. Fortunately, they were lovely and we finished stoking just before the 96 hour mark. We hadn't been finished for long - maybe an hour or so - when we were treated to another rainbow, this time with an end in each of our fields. A magical way to culminate months of work . . .
We'll be back next week with photos of the new pottery! You can see our pieces at one of our upcoming shows. We'll also have new things in our shop a little later in the summer. We're pretty excited about what's happening in our new studio these days. Not only is it simply a gorgeous place to be, but it's been quite a while since we had some regular creative time with clay, and we had both forgotten how HAPPY it makes us . . .
Our new studio got its first delivery of clay a couple of weeks back from Vermont Ceramic Supply. We use primarily cone 10 bMix from Laguna, but we custom order a ton (yes, 2000 lbs) to have a lower pentrometer reading. That just means the clay has a higher water content which makes it softer . . . it's easier on our hands when we're throwing a lot. Lego is loving the new building, too . . . he spends his days 'guarding' both us and the chickens . . . half in, half out. 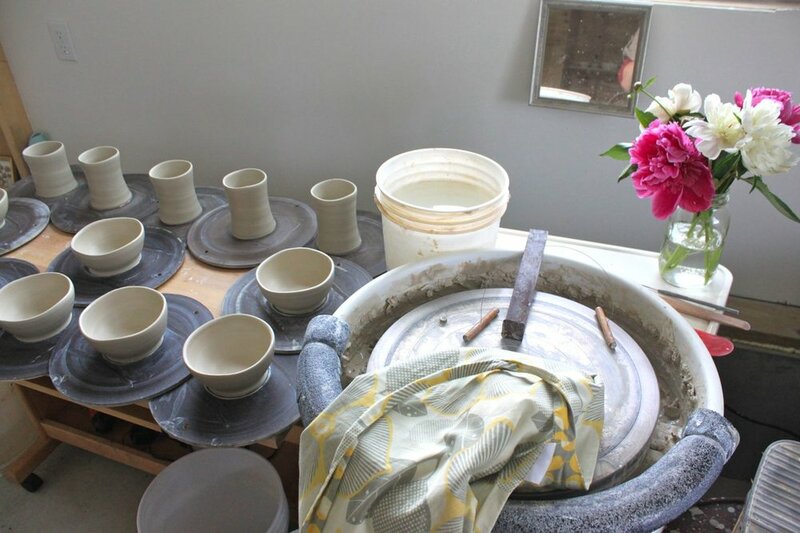 Becca's been working on filling some orders, including a wedding registry and a dinnerware order, so there are lots of plates and bowls in the works. 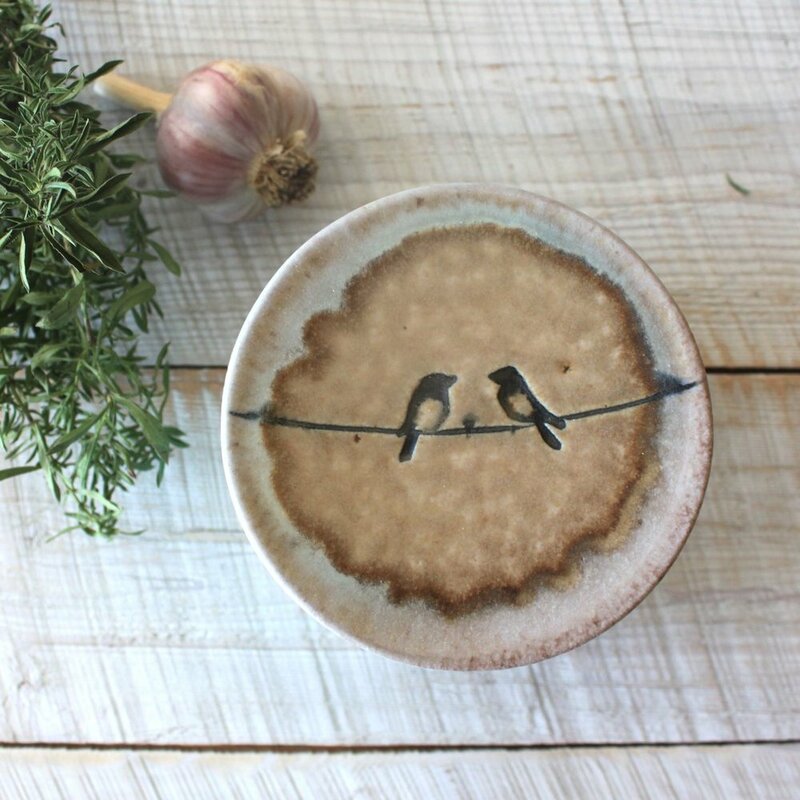 Also making an appearance are collaborative batter bowls, tumblers, quite a few pieces with Becca's signature pebble designs, and some new twists on past designs, too . . .
And a happy potter with some very large fermenting crocks by special request . . . can't wait to see how these all turn out! Our firing is scheduled for early July, so we're still going strong in order to fill all 350+ cubic feet. It's nothing if not satisfying work . . .
We've got some great events coming up in the next three months! Hope you can join us at one of them. We're also open at our home studio on *some* Fridays and Saturdays this month and next. We'd love to show you, your friends, and family, around our new studio, showroom, and wood-kiln. Find us open on the following Fridays, 2-6pm : June 14 & 21, July 12; and the following Saturdays, 12-4pm : June 15 & 22, July 13. Stay tuned for updates on late summer + fall hours, and please call ahead if you're coming from a distance! And last, but definitely not least, is the 80th Annual League of New Hampshire Craftsmen's Fair, referred to by some as "Sunapee." It takes place at Mount Sunapee Resort in Newbury, NH (near New London/Dartmouth-Sunapee Region), from August 3- 11th this year. 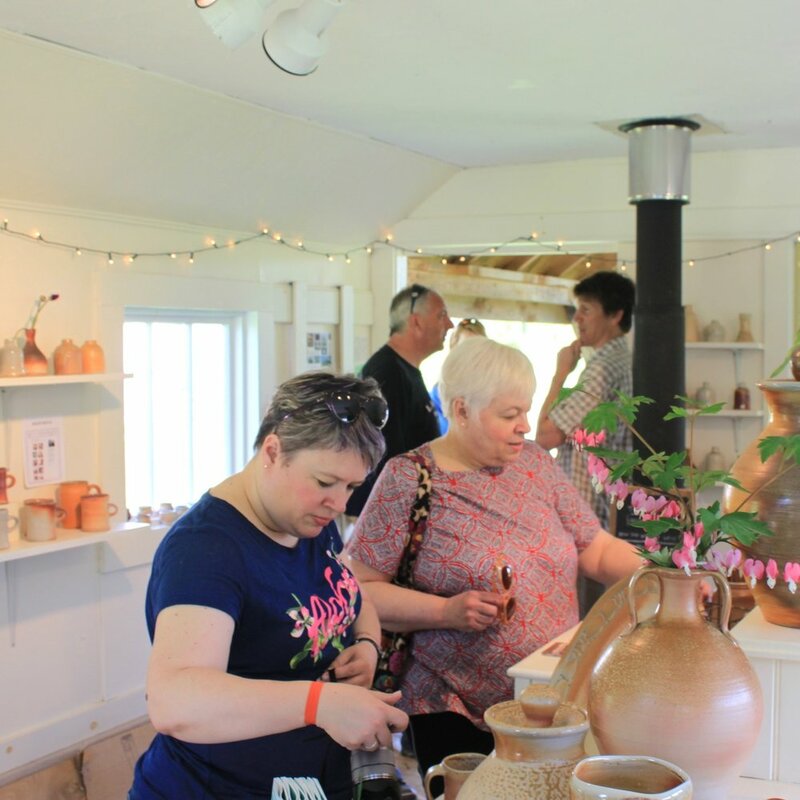 It's the oldest craft fair in the country, running for nine whole days, with literally hundreds of handmade exhibitors, performances, and demonstrations. The fair is open from 10am to 5pm daily, and open until 7pm on Friday the 9th! We'll be in the same spot as the past few years - the very front of Tent #6, Booth 628. 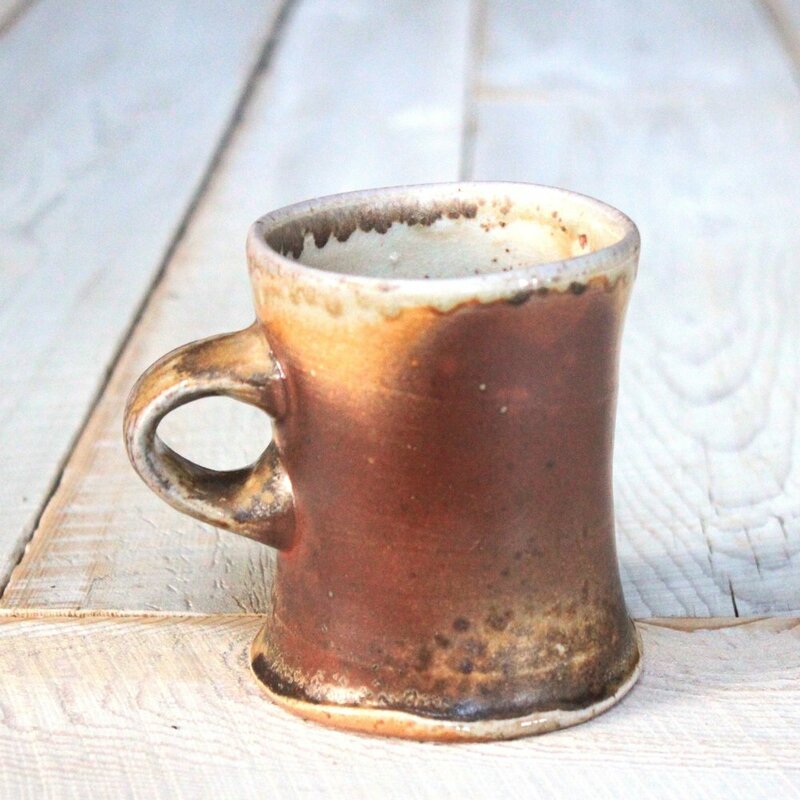 If our July firing goes well, we'll have lots of brand-new wood-fired pottery at the Clam Festival and Sunapee Fair . . . Questions? Need directions? Want to schedule another time to see our work? Reach us at (802) 234-1320, or nathanandbecca@gmail.com.